Surely nothing with the word “butter” in it can be healthy, right? Thankfully, that’s totally not the case when it comes to peanut butter. The main reason that people on low-calorie diets avoid peanut butter is because it’s high in calories. Just 1 tablespoon of peanut butter contains a whopping 90 calories. So if peanut butter is high in calories, how on earth can people claim it’s healthy? The reason it’s high in calories is because it’s high in fat – good fat. One serving of peanut butter contains 8g of monounsaturated fats and 4g of polyunsaturated fats. These fats help reduce the risk of heart disease, lower cholesterol and lower blood pressure. The best thing about making peanut butter at home is that you’re in charge of what goes in it. I’m sure this will come as no surprise to you, but the main ingredient in peanut butter is peanuts. Even the cheap peanut butter you buy at the store is made of mostly peanuts. But there are a few little additions that make healthy homemade peanut butter even better. To make the texture creamy and smooth, add peanut oil. Technically, any kind of oil will work (olive oil, canola oil, vegetable oil…) but I recommend using peanut oil because it doesn’t affect the taste. For a hint of delicious sweetness, add a little bit of honey. Again, you can use any type of sweetener, but I recommend you use a liquid one (maple syrup or agave nectar are great alternatives) because it improves the texture. It’s best to avoid artificial sweeteners, like Stevia, because they impact the taste too much. The final thing you should add to improve your homemade peanut butter is salt. Why? Because salt makes everything better and you only need a tiny sprinkle to really enhance the flavour. You only need 1 kitchen gadget to make the most amazing healthy peanut butter at home in 60 seconds. A NutriBullet. I never use it for smoothies (I’m just not a smoothie person) but I use it for loads of other things – from healthy 3-ingredient banana pancakes to healthy vegan brownies. Seriously – there’s nothing this machine can’t do. When using your NutriBullet to make homemade peanut butter, make sure you’re using the extractor attachment and not the milling attachment. The milling attachment has just 1 blade, while the extractor attachment has 2 blades which cross over each other. If you follow this recipe with the milling attachment, you’ll end up with peanut flour. Technically, you can make peanut butter in a food processor or even a blender. There’s actually a recipe on Happy Healthy Motivated showing you just how to make peanut butter in a food processor. But you’ve got to have some serious patience to do it this way. It can take up to 30 minutes to make peanut butter in a food processor, compared to the genuine 1 minute it takes to make it in a NutriBullet. Not only that, but the NutriBullet is a million times more powerful than your average food processor. 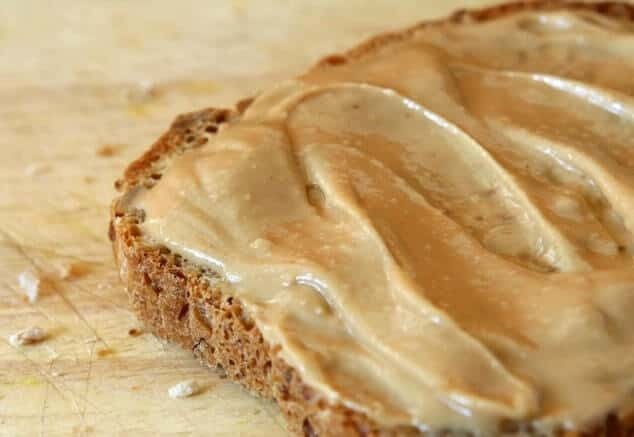 If you regularly make this healthy peanut butter recipe in a food processor, you’ll get through a lot of food processors! But the NutriBullet is powerful enough (and the extractor blades are strong enough) to make it easily. Homemade peanut butter in the NutriBullet is also healthier than making it any other way. Because food processors and blenders aren’t as powerful, you have to add more oil to get a wonderfully smooth texture. More oil = more fat = more calories. 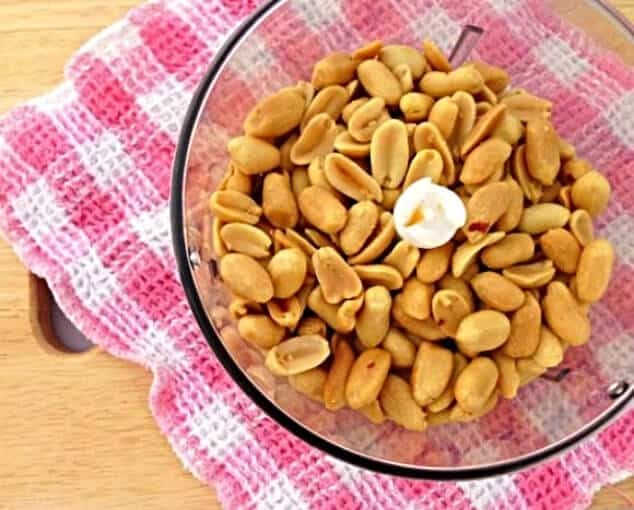 You only need to add the tiniest amount of oil when using a NutriBullet because the blades whizz the peanuts into smooth creaminess in no time. Because this healthy peanut butter recipe doesn’t contain any preservatives, you might imagine that it doesn’t keep very long. Wrong! Homemade peanut butter stays perfectly delicious for up to 6 months as long as you store it inside an air-tight sterilised container. Do you need to refrigerate homemade peanut butter? This one’s a bit tricky and sort of depends on how quickly you go through peanut butter. If you think you’ll work your way through 1 jar of the stuff in a week (Can I please come and live with you? Your life sounds delicious) you can keep it at room temperature without any problems. But if it’s going to take you more than 1 week to get through the jar, you’re best off keeping it in the fridge. This is because the oils can go off if they’re sat at a warm room temperature for too long. But don’t worry – to get your peanut butter back to a spreadable consistency, just take it out of the fridge 30 minutes before you want to use it. Now you’ve got the most incredible healthy peanut butter recipe, you need some ways to use it! After all, peanut butter on toast gets a bit boring after you’re munching on your 10th slice. 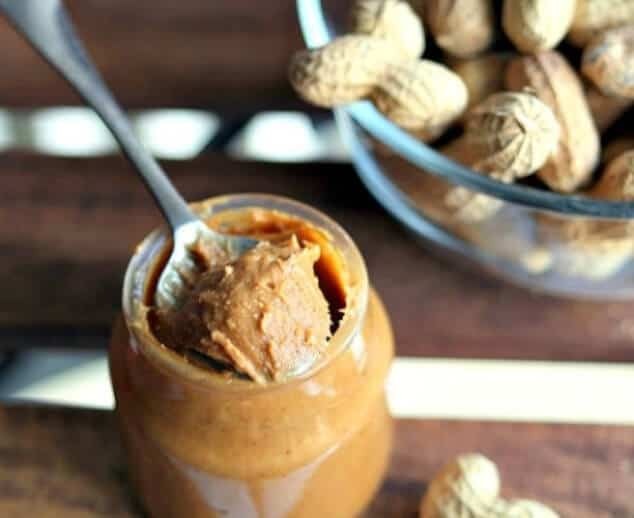 Click here to sign up for my newsletter and I’ll send you 10 amazing healthy recipes you can use your new homemade peanut butter in! A smooth creamy texture, deliciously nutty flavour and just a tiny hint of sweetness is what this healthy peanut butter recipe is all about. Spread it on toast, stir it into oatmeal or eat it straight out the jar! Add all the ingredients into a large NutriBullet container. Screw on the extractor blade attachment and blend for 5 seconds, until a dough-like mixture forms and sticks to the walls of the container. At this point, the blades will not be touching the peanut mix and you'll hear a change in sound. Remove the container and scrape the peanut dough from the sides. Screw the lid back on, place the container onto the base and blend for 10 seconds, until you've got totally smooth peanut butter. 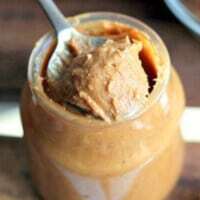 Transfer the peanut butter to a sterilised jar and store at room temperature or in the fridge. This peanut butter will keep perfectly well inside a sealed container in the fridge for up to 6 months. Wow! I’m impressed! I buy all natural peanut butter – peanuts and salt are the only ingredients. So many nut butters are so expensive, but this would be a much more economical way to do it! Any advice on sterilizing the jar before storage? I really struggle to get a hold of natural peanut butter where I live – that’s why I make my own! To sterilise glass jars at home, I simply place them in a large pot of water and boil them for around 10 minutes or so. My NutriBullet Pro 900 locks up and won’t turn the cup of organic dry roasted Valencia peanuts after a few spins. Why! Just did it. But I think the peanuts I used may not be the best for peanut butter – the peanuts taste nice on their own, but not as peanut butter. Is there a certain peanut type or brand that you find tastes best . . . like natural peanut butter you buy (no palm oil, but with oil on top) in the store? Thank you so much for the instructions and the recipe! I was searching if the Nutribullet does this because is not mine and I was afraid to heat the motor, but yeah, 1700 w is so powerful so I’m pretty excited to do the peanut butter by myself. Can I use the Nutribullet for anything else (besides smoothies and soup obviously)? Make doughs for some raw cake? Maybe a Food Processor is better? How many watts do you recommend for that? Hi Catalina! I use my Nutribullet to do pretty much everything you can with a normal food processor or blender – it does it all much faster! As well as peanut butter, you can make all kinds of other nut butters as well as muffin, pancake and cake batters like you said. I use mine to make hummus. A tin of chickpeas drained and washed – retain liquid from tin, clove of garlic minced, two teaspoons of tahini, two teaspoons of olive oil, good pinch of salt, juice of a lemon, up to 3 or 4 tablespoons of water (from the liquid in the tin). That’s such an amazing idea, Christina! Definitely going to give it a try. I use my Nutribullet for so many things but never thought of this. I have to try it. You’ve GOT to try it, Janette! I make my own batch of peanut butter at home but as you said, it does heats up the food processor. I have never thought of using Nutribullet and I think I know what I am going to gift myself for my birthday ???? It’s a gift you definitely won’t regret, Sia! Sweet, salty and so quick to make, I’ll always say homemade is the best way to go! Totally agree with you, Erren. Homemade is always best! There are some amazing peanut butter add-ins out there! I mean, when you make your own, the sky is the limit as far as interesting combinations! And peanut butter can be so expensive when you buy a “custom blend” – this is great for making your own! I have a Vitamix and this should work too! This would definitely worth in a Vitamix, too! Never though about experimenting with different add-ins. You’ve given me a great idea, Emily! I have everything I need for this recipe — except the nutribullet — but I imagine my VitaMix will give me the same result! I love that I can control the sweetness in this recipe! I never knew this process could be so fast, easy, and fun. Thanks for sharing! It really is super simple and so tasty, Hannah! Such a great recipe! sweet,salty at same time! awesome! I’m so glad you like it, Prasanna! Couldn’t agree with you more, Demeter! I seem to use mine to make everything except smoothies, Calleigh! Thanks so much, Helene. I bet I’m still eating peanut butter when I’m 89, too! It will save you sooooo much time, Kristen! Just a few ingredients and a few minutes and homemade peanut butter is mine. I also like that it can be stored for so long in the fridge. Hey, Georgia! I’ve just taken a look at my NutriBullet and I honestly don’t have a clue! It doesn’t say on the machine itself and I don’t have the box or any documentation any more. But I don’t see why it wouldn’t work with any NutriBullet. I am excited to try this recipe with my Nutribullet however I’m wondering if I can use any other oils besides peanut oil? Would it change the flavour too much with a different oil? Hi Karin! I’m so sorry for the late reply – I’ve been away for a couple of weeks. Any oil without a strong flavour (like canola oil) would work really well. How long does it last at room temperature? We’re not a fan of refrigerated peanut butter. Hi Stephanie. I agree, peanut butter is loads better at room temperature. I’ve kept mine safely at room temperature for up to 2 months. Make sure you keep it in a properly sealed jar somewhere dark and cool – like in a cupboard or kitchen drawer. Hi Maggie! I’m so sorry the recipe didn’t work out for you – but I think I might know what went wrong. Is this the blade you were using? – https://www.magicbulletparts.co.uk/shop/nutribullet-compatible-parts/nutribullet-flat-milling-grinder-blade-600w/ If so, that’s the milling blade designed to create flour-like mixes. You need to use the cross extractor blade (https://www.magicbulletparts.co.uk/product-category/nutribullet-compatible-parts/cross-extractor-blade/) to make real peanut butter. Thanks so much for pointing out the missing info. I’ll add it into the post when I update it this week! This recipe is so easy and amazingly delicious! Nicola, bravo! What a great idea! Love this. I’m sure this is incredibly delicious! Nicola, it looks so yummy! I love the step-by-step instructions, making it an easy recipe to follow!